Before I go further, I want to say right here and now that I would never take back my wedding day. It was wonderful. The number of toasts that were given by everyone literally made my wedding day great! I am a storyteller and the number of stories shared at my wedding really honored what George and I are all about. And of course, George is undoubtedly, the man I was meant to marry and he is my best friend in the whole world. I would never take back my wedding day. I’ve been doing a lot of thinking lately. And the honest-to-goodness truth is that three years ago, I really didn’t know a lot about planning a wedding. In fact, I never did that thing that young girls do when they dream of their future wedding day… I just knew I’d get married when I was 23 years old (which I did, by the way) and that’s all I really knew about it. That I would be 23 at the time. Now, being IN the wedding industry, I find myself daydreaming about what I would do, pick, make, or wear all the time! And I’ve realized that I would do things way, way, WAY different if I were to get married now. George and I made several mistakes when we were planning our wedding. We didn’t really think about how to make the wedding reflect who we were as a couple and we made choices that were simply convenient. And that’s a huge mistake! One, I fear, that couples make all the time in their planning process. We’re going to do it over. Call it what you will— “vow renewal” or what-have-you—but we’re going to re-do our wedding. We’re already married, so what’s to stop us from creating a day about us, for us, and without all the outside influence that can effect our decisions in negative ways? I mean… Isn’t that how it should be when planning your wedding? It’s our hope that through this process, others can learn, take heart, and make their decisions based on what’s important to them and no one else. There have been so many times where I’ve encouraged my brides, telling them “it’s your day” and “stand up for what you want” and in the back of my mind, I think to myself, I wish I had… And please don’t misunderstand! 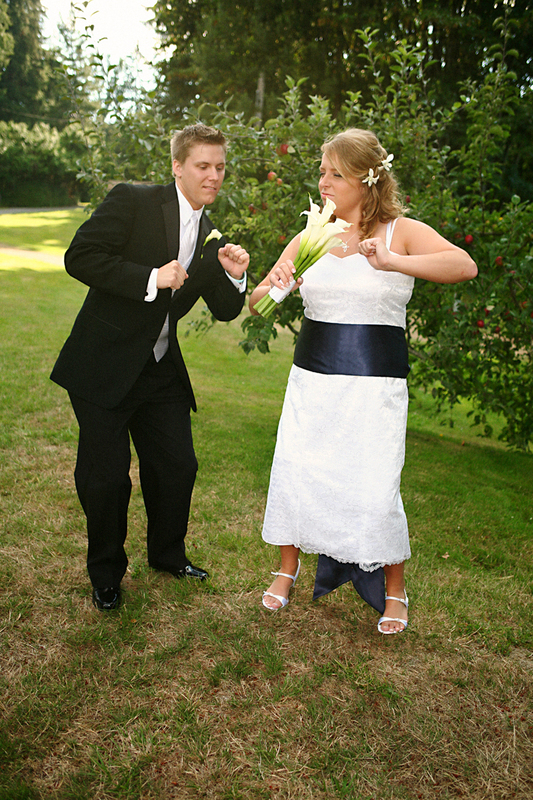 There was no one dictating what I should or should not do for my wedding! There were simply people who made suggestions and without thinking, I would simply say, “Okay, sure,” because either A) I didn’t want to hurt someone’s feelings or B) I didn’t know there were other options. Being 45 pounds heavier when I got married, I was terrified to go dress shopping. So I didn’t. A friend suggested a woman who made her wedding dress and I paid her to make mine. Was I thrilled by what she made? No, not really… But it was super cheap and it fit. So I went with it. We rented tuxes. Do I like the look of a tux? Not really, no… I actually prefer something simpler, less bulky… But for some reason, I was under the impression (or influence) that tuxes were essential. But they’re not. They’re really, really not. Our location. While it was gorgeous, affordable, and unbelievably convenient—it was also our reception and it was down the street from my house—I now envision a ceremony set entirely outdoors. The venue was chosen so quickly (for convenience) that I didn’t even have a chance to play around with the idea. Trust me. I realize this sounds excessive. Planning our wedding again when we’re already married and have been for almost three years. But we’ve learned a lot since we got married in 2007 and we’d like the chance to try again. Not to mention, there are certain experiences I never had the chance to do—like shopping for a dress—that I’m tired of regretting. So for the next several months, we’ll be going through the same process as our clients. Picking colors, dress shopping, checking out venues, the whole deal. And we’re inviting you to come along for the ride. i think this is an amazing idea! ummm…you are TOTALLY sane! i have been DREAMING of doing this same thing! we got married in a church, jared wore a tux AND i was 65 lbs heavier. ummmm, i SOOOOOO feel you!!!! CONGRATS! this is super exciting!!! have fun! love yall! DO ITTTTTT! Fortunately, being so obsessed with the whole wedding planning process, and wanting it to be very uniquely “us” and handmade and colorful and southern and FUN…. that’s what kind of sparked my love for weddings and I think it made a huge difference in me wanting to pursue wedding photography. It is SO MUCH FUN. Seriously. I wouldn’t trade that year of planning for anything, especially getting to do it with my mom, and to have so many people close to our family who contributed their time and talent to making it what it was. And now, you’re so much more educated and experienced! I can only imagine how awesome it will be! Fantastic idea. I always think, why not celebrate love? Please do it! I can’t wait to follow along on your journey! I like it is good in all aspects of you life (personal and professional)! WOO WOO!! We totally want to do the same thing! I say go for it. Why not!? And OMG this doesn’t look like you guys at all! OOOOH! Maybe I could actually be there this time!!! hey! it was so good to finally meet you and george in south carolina! i kind of felt like i was meeting celebrities since i’ve been following you guys for so long now. haha. by the way, petter and heidi’s pictures are so, so breathtakingly beautiful. i was literally squealing with joy when i saw that you put them up. anyways, i think this is such a fantastic idea! no doubt you guys have learned tons about weddings these past few years, so i say go for it all the way! i can’t wait to see what you come up with. Pure awesomeness! Go for it – why not? That photo is so funny, in a great way of course. Seeing my wedding pics from 8 years ago is crazy, we change so fast. Rock on! Yep, I understand the reason why, and yep your are insane, but I would expect nothing less!! Which is why I love you guys. PS Are you going to keep the long black tail? I think it’s an awesome idea! Totally go for it. We’re planning to renew vows because we had NO wedding! Being military, the discussion went like this…”When can you take leave”…”in a month”…”ok, we’ll get married then”. lol So, big redo for us. lol GO FOR IT! Do everything you want..and best thing…No “rules” for renewals! Gees! How did I miss this!? This is COOL.